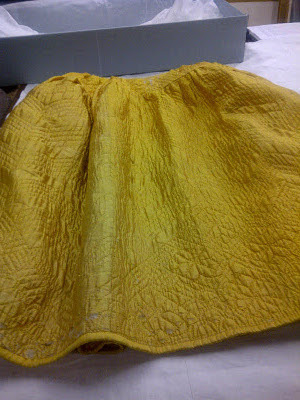 Among the one of the most striking pieces in the Irma Bowen Collection At the University of New Hampshire Museum is a dazzling canary yellow quilted petticoat. Made of silk, lined with wool and flax, This cheery, warm garment was worn by Temperance Pickering Knight (1731-1770) of Newington, NH. 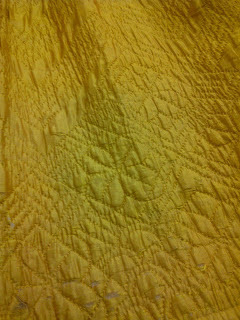 It is a significant survival and not surprisingly at mid-18th century, similar to earlier British-made counterparts. In addition to the petticoat, there is evidence to suggest that a pair of silk brocade pattens or clogs may also have belonged to her. The style and construction would be appropriate. The second wife of John Knight, Temperance was married 15 March 1759 at the the age of 28. Knight ran a very profitable business, operating the ferry between Newington and Dover Point. This would explain the expensive clothing attributed to Temperance Knight. After having the opportunity to examine her canary quilted petticoat, I started on a quest to find Temperance Pickering Knight's headstone which I had heard was "embedded" within the expansive mall area of Newington, NH., which is where she was born and married. As it turns out, I had actually seen the remains of the small plot, adjacent to an “I Party” store some five years earlier and knew exactly where it was located. The burial site is in a state disrepair and the handful of stones within the borders are barely legible and eroded from the elements and years of past vandalism. 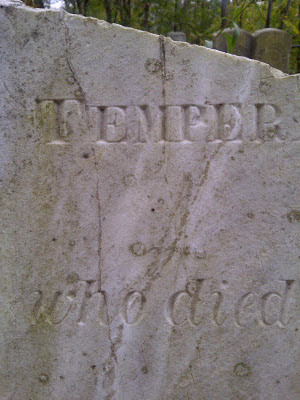 While Temperance's headstone is badly damaged and the upper third severed, there is nonetheless a powerful connection with her through the stone. It is possible to make out her name and death date on the the stone despite the damage. Note the deeply incised and elegant serifed lettering. 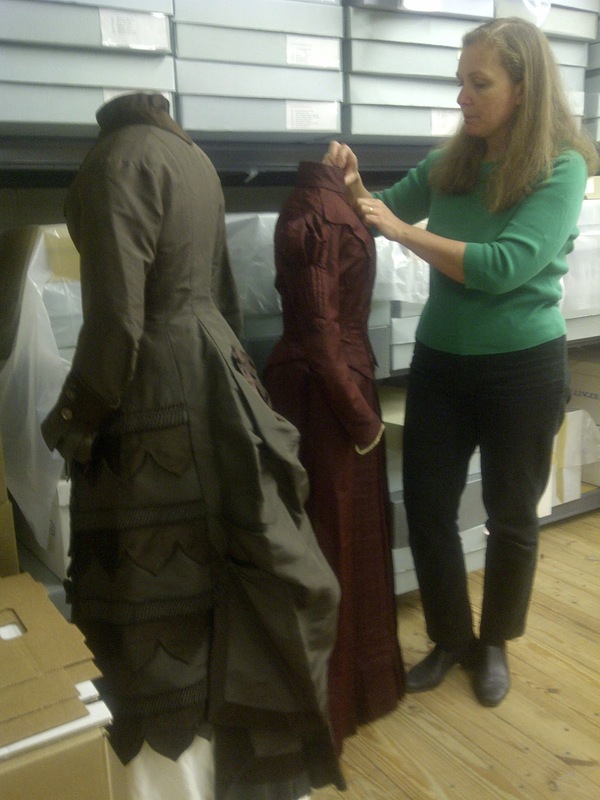 Fashion and costume historians, textile and sewing enthusiasts can applaud the foresight of family members and UNH instructor, Irma Bowen, for the survival of this rare garment. Fortunately, Irma Bowen, began collecting examples of needlework and textiles back in the 1920s for the benefit of her students. The fact that we can actually put a name and a biography with this striking, well-crafted and expensive garment, amplifies its significance tremendously. Knowing an approximate time period when the petticoat was worn and where, a small northern New England community, has attracted the attention of students and costume historians over several decades. The author thanks Astrida Schaeffer, costume historian and mannequin maker at SchaefferArts, and Dale Valena, Curator, UNH Museum, for making the textiles available. http://members.tripod.com/Al_Beagan/April4/3565.htm and a there are a number of key documents at the Rockingham County Probate Records. Possibly worn by Lady Mary Radclyffe Stanhope Gell (d. 1653), these late 17th century shoes are in the collection of the Northampton Shoe Museum. I long to see these shoes. Without question, they are lovely: blue velvet with lavish silver gilt thread, the embroidery comprising a naturalistic foliate pattern. The contrast between the dark hues of the background and the luminescent quality of the silver thread must indeed be striking - even more so when first completed. 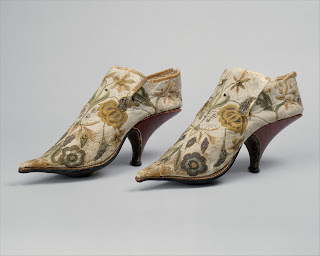 They feature the high, elegant heel and narrow toe fashionable during the latter quarter of the 17th century. Ribbons would have tied the lachets across the tongue to secure the shoe, thereby providing another opportunity to capture an onlookers gaze. 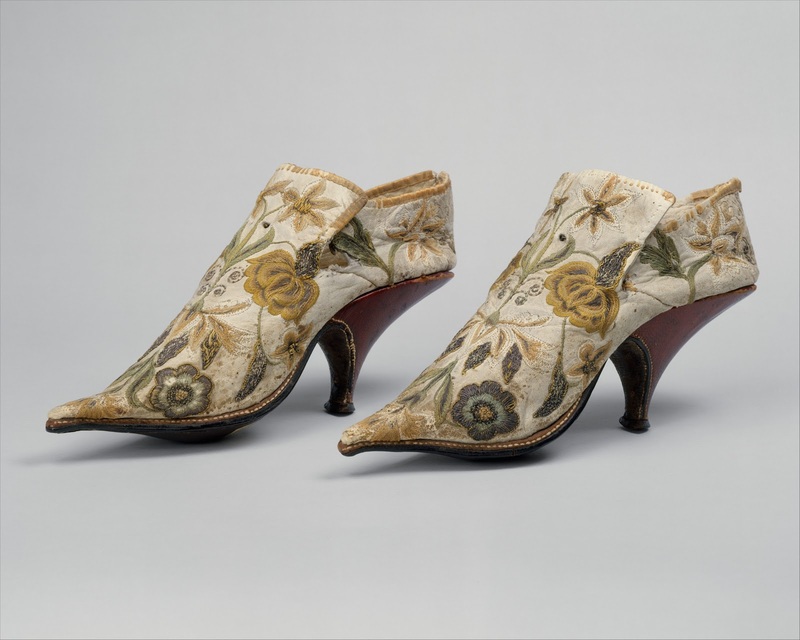 As feminine as Lady Mary's shoes may appear to our contemporary eye, a quick look at men's shoes of the time reveals their "masculine" antecedents. 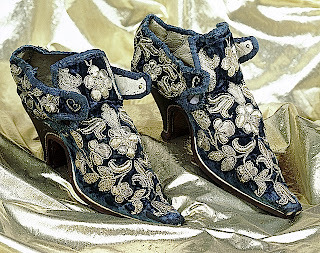 Coming out of the French Court of Louis XIV and popular in England following the Restoration of Charles II, men placed high value in their footwear which featured similar luxurious treatment found in women's shoes: gold and silver threads, silk brocades and damask, over sized bows and ribbons and jeweled or paste buckle closures. Men of "standing" wanted to show off their shapely legs and stylish, graceful feet not only through footwear, but also with luxurious hose. This represents quite a change over the centuries - as many women will select high heels over flats to draw attention to legs and derriere. 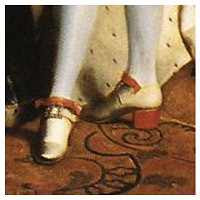 Although by the early 18th century, women were less enamoured of wearing shoes modeled on men's style, the masculine terminology associated with cordwaining persisted. While Lady Mary's shoes are indeed stunning, the war ravaged history of the Parliamentarians, Cromwell and ultimately, the Restoration of Charles II (1660) swirling around them is extremely intriguing. Indeed, as layers of historical fact and fiction surrounding Lady Mary's life are peeled back, they could easily constitute a historical novella. Lady Mary Stanhope (nee Radclyffe) reportedly died in April 1653 near Covent Garden, London. 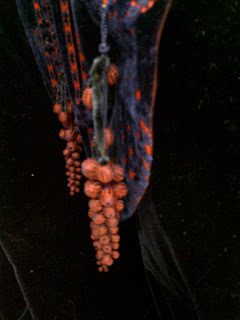 If this is in fact the case, this pushes the date the shoes were worn to prior to the current date posited of c. 1660. Lady Mary and Sir John Stanhope (d. May 29, 1638) were married and lived in Elvaston Castle or manor, in Derbyshire. Constructed by Sir John's father in 1633, today it is a 200-acre country park. Lady Mary and Sir John had one son, also named John. Following her husband's death in 1638 she remarried - this time to his enemy, Sir John Gell (1593-1671). Gell is remembered, among other politically motivated events, for his irascible and unyielding temper and for his ceaseless harassment of Stanhope. Stanhope came under Gell's various attacks while he was Sheriff of Derbyshire in 1634 and was exacting "the obnoxious tax of ship money" on behalf of the "King's arbitrary measures" (Hutchinson, 101) It is reported that at one point, Gell actually starved out Stanhope's cattle. Not surprisingly, the union between Lady Mary and Sir John Gell was brief and they separated after just over a year. Clearly, Gell was intent on destroying all he could of the deceased Stanhope - "abducting" his wife or "deluding her with hypocrisies." It is even noted by some historians that he defaced Sir John's effigy in Elvaston Chapel. A complex political figure, Gell also spent time in the Tower of London. 4. Portrait of Mary Radclyffe, William Larkin, c. 1610-1613. Courtesy, Berger Collection, Denver Museum of Art. This striking portrait by Larkin is described on the Berger Collection web site: William Larkin painted some of the most fashionable figures of the Jacobean period. 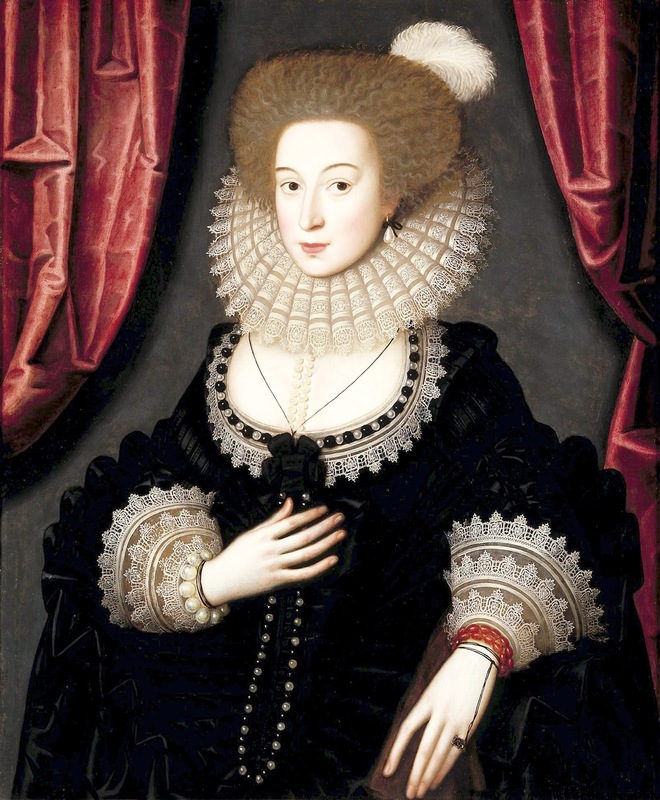 Among them was Mary Radclyffe, the wife of Sir John Stanhope of Elvaston, who rose to prominence as a courtier during the reign of James I. Mary's costume helps us date this portrait quite accurately. Her low-cut dress, closed ruff, simple pearl jewelry, black silk string ties, and feathered hair were all the rage in the first decade of the seventeenth century; but in 1613 the style fell rapidly from fashion. The painting must therefore have been painted just before that date. Behind Larkin's subject are two elaborately draped curtains. He used this device so often that until he was definitively identified in the twentieth century, he was known simply as the "curtain master." On a recent trip to Florida, a lucky parking spot led to a fantastic vintage shopping find at Shangri-La Vintage Boutique (www.shangrila-vintage.com). The experience was memorable from the well-selected sale items to the knowledgable proprietors. I was there with my sisters and we all have different tastes and interests and yet all left satisfied. In addition to the high quality selection and good condition of the items, the ambience was just right. The hats, bags and shoes were all well presented, as you will see in the photos from the boutique. Of particular note, they had an extensive array of vintage men's clothing, including original 1960s Hawaiian bowling shirts. My fav: an original Hallmark paper dress, still in its packaging, from the 1960s, which boasted that you could cut it to desired length, wear it for a party and then throw it away. Perfect for travel! If you visit Fort Walton Beach, Florida, you will find a row of stellar shops including the Cupcakery by the Sea, Hugs & Hissyfits, the Closet Swap (saw a great pair of Louboutins there) and many more. "A dress should never overpower its wearer. It should merely be an appropriate frame for a charming picture....It isn't every woman who knows how to wear a dress." The concept for Embellishments: Constructing Victorian Detail originated with a 2012–2013 exhibition of Victorian garments at the University of New Hampshire. Embellishmentsis a fashion time travelers’ armchair tour. In the absence of any narration from those who wore or owned the clothing, consider the historic pieces themselves, dating roughly from the 1870s–1910s, as your guide. The book is based on ten Victorian garments—a haute couture tea-gown, English-inspired day and wedding dresses, and an American walking suit, among others. Follow respected tailor of historic clothing and mannequin maker, Astrida Schaeffer, as she demonstrates the sewing techniques that recreate period embellishments. 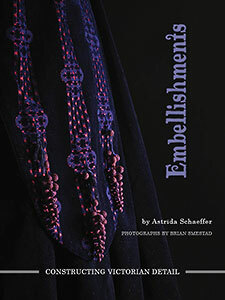 The publication will be a bookshelf favorite for contemporary designers, costume historians and sewing enthusiasts alike. Savor Brian Smestad’s stunning portrait-style photographs of the garments, accompanied by elegant details shots, which illuminate the technique section of the book. Delight in the opportunity Embellishments provides to examine and reinvigorate the Victorian aesthetic through the use of sewn adornment.